Micron, You Had Me at "$10 Billion Share Repurchase Program"
The chipmaker had another knockout quarter, and it may not be too late to jump on board. A value investor at heart, I can't resist Micron after the company reported last quarter's results. Its price-to-earnings ratio is in the single digits, debt is getting reduced to neutral with cash, and a share repurchase program will commence later this year. Even though it's been a great run for the memory-chip maker, Micron's stock looks like a unique investment in the industry: strong growth at a steep discount. Micron recently released results for the third quarter of its 2018 fiscal year. Suffice to say the numbers were very good. Digital memory chips are often thought of as a basic commodity in the tech world, but the company has nevertheless experienced explosive growth for its product as the need for it has increased in applications like data centers, industrial equipment, and automobiles. What caught my eye in the report, though, was Micron's fast-changing capital allocation and shareholder return policy. The company has had to take out a lot of debt for years, peaking at just shy of $10 billion at the end of its last fiscal year. Plus, while many corporations have boosted profits in the last decade by repurchasing their own stock, Micron has not been able to do so with its profit margins under pressure. All of that is changing this year. Debt of $2.3 billion was paid down or converted in the last quarter, and a $10 billion stock repurchase plan will commence later in the year as part of a plan to begin returning at least 50% of free cash flow to investors. 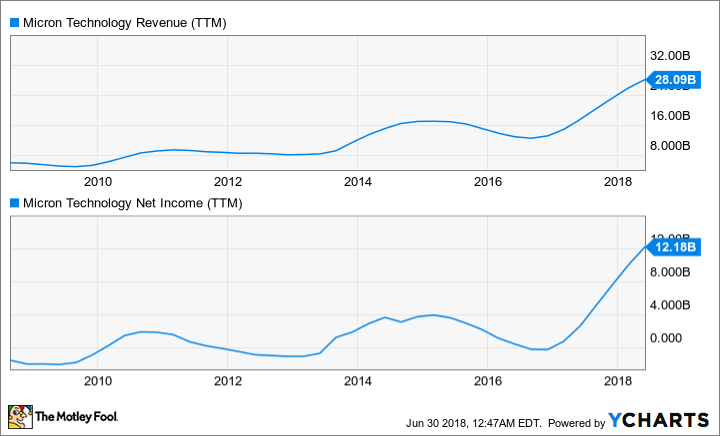 While double-digit revenue and profit gains in the last year equated to 60% share price appreciation, this most recent news regarding profit maximization has been met with shoulder shrugs. The stock is down 11% since the report as of this writing. At this point, Micron's P/E ratio sits at a lowly 5.3 and 4.5 on a one-year trailing and one-year forward basis, respectively. As mentioned before, some of the critique has been the elevated debt load compared to cash and cash generation. Some of that shows up in the valuation when comparing Micron to other chipmakers. While a concern, borrowing isn't all to blame for the cheap valuation. Other chipmakers carry similar burdens but still tote higher valuations. Rather, the big concern is that Micron's memory chips are a commodity product, making pricing highly dependent on supply and demand. If demand wanes or supply gets out of hand, prices on memory chips could fall and have a big impact on the stock. Such has been the cycle for Micron over the years. Micron has addressed this problem with technology like 3D XPoint -- jointly developed with Intel -- for use in data centers and other big data applications. Nevertheless, most of its business is still commoditized, making the risk of a downturn in the semiconductor industry a real concern. Other manufacturers have already transitioned to specialized businesses and thus have made the case they deserve a higher valuation. However, the tech environment in which we now live, where semiconductors are increasing in importance and number of applications, is still untested by a major industrywide downturn. Micron is priced for a great deal of bad news, while others are not. Pair that with a $10 billion share buyback -- which equates to about 15% of the company's total valuation using enterprise value -- and debt reduction plan, and Micron looks like one of the biggest bargains around right now whether it's a commodity supplier or not. Micron, count me in.